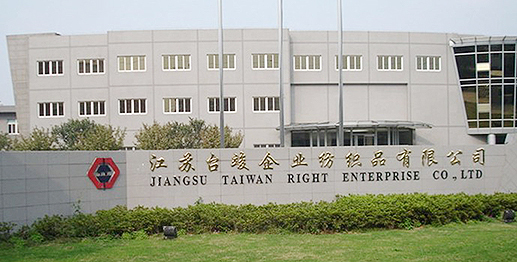 About Us 关于我们-Taiwan Right Enterprise Co., Ltd.
Taiwan Right Enterprise Co., Ltd. was founded in 1979. Factory is located in both China and Taiwan. Total square measurement of the factory in Wu Xi, Jiangsu Province China is 65,000 Square meters. Our company is a textile company which produces and exports various socks ranging from 56N to 400N with most up-to-date computerized machines. Our major exporting areas are USA and Europe. We have control of every step like knitting, sewing and packing, so we can ensure you good quality. Our factory is passed the audits of JC Penny, Wrap, Sedex, Wal-Mart, The Children's Place, Disney, Kohls, Tween Brands, ISO9001 and etc. Comfortable socks make a good life. Reasonable prices make you more competitive in local market. Good quality and good cooperation make us double win. If you are interested in any of our products or would like to discuss a try order, please feel free to contact us. We are looking forward to forming successful business relationships with new clients around the world in the future.